Worcester have added to their backroom team by appointing Nick Johnston in the newly-created role of high performance director following his departure from Northampton Saints. 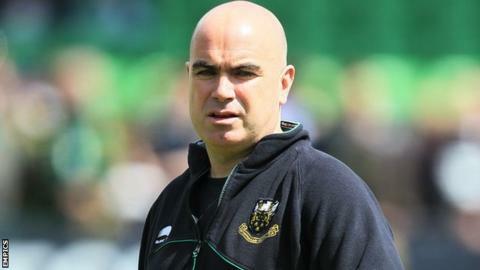 Johnston left Franklin's Gardens in October after five seasons with Saints to concentrate on parental responsibilities with his young family. But Warriors boss Dean Ryan has persuaded him to move to Sixways. "This is exactly the challenge I've been looking for," said Johnston. "Having left Saints after several wonderful years I needed a new challenge. And I cannot wait to get started. What does a 'high performance director' do? "It's a real coup for Worcester to have landed Nick Johnston. He will have been brought in to improve the players' fitness levels. He won't take any nonsense. Saints pride themselves on their fitness and that is in part down to him. The players used to dread pre-season." "I am excited by the vision which this club clearly has. I have known Dean for many years and I am a great admirer of everything he has done in the world of rugby." After joining the Saints backroom staff from Sale as performance director in 2008, Johnston helped Northampton reach six major finals in as many seasons. "We're in a much stronger position than we were five years ago, and a lot of that is down to Nick," said Northampton director of rugby Jim Mallinder. "He has put in place procedures and practices that will stand us in good stead for the future, both with the first team and with the younger players in the Academy system." Although his team are currently marooned at the bottom of the Premiership, the ambitious Ryan would love to bring similar success to Sixways. "I know this appointment will be a tremendous boost to this club," said the Warriors director of rugby. "It is further evidence of our ever-increasing commitment to our long-term development. "Nick's record in high performance management and the development of the academy programme is second to none." Johnston will work at Sixways alongside Ryan, head coach Carl Hogg, backs coach Shane Howarth, defence coach Simon Cross, academy transition manager Sam Vesty and veteran prop Ceri Jones, who is the scrum coach. Worcester are back in Premiership action at Sale on Friday, when they will be looking to avoid a 13th straight league defeat.